Mark Lavon "Levon" Helm (May 26, 1940 – April 19, 2012) was an American musician and actor who achieved fame as the drummer and one of the vocalists for the Band. Helm was known for his deeply soulful, country-accented voice, multi-instrumental ability, and creative drumming style, highlighted on many of the Band's recordings, such as "The Weight", "Up on Cripple Creek", and "The Night They Drove Old Dixie Down". Born Lavon Helm in Elaine, Arkansas, Helm grew up in Turkey Scratch, a hamlet of Marvell, Arkansas. His parents, Nell and Diamond Helm, were cotton farmers and lovers of music. They encouraged their children to play and sing at a young age. Helm began playing the guitar at the age of eight and also played drums. He saw Bill Monroe and His Blue Grass Boys at the age of six and decided to become a musician. Arkansas in the 1940s and 50s stood at the confluence of a variety of musical styles including blues, country and R&B. Helm was influenced by all these styles which he heard on the Grand Ole Opry on radio station WSM and R&B on radio station WLAC in Nashville, Tennessee. He also saw traveling shows such as F.S. Walcott's Rabbit's Foot Minstrels that featured top African-American artists of the time. Another early influence on Helm was the work of the harmonica player, guitarist and singer Sonny Boy Williamson II, who played blues and early rhythm and blues on the King Biscuit Time radio show on KFFA in Helena and performed regularly in Marvell with blues guitarist Robert Lockwood, Jr. In his 1993 autobiography, This Wheel's on Fire: Levon Helm and the Story of the Band, Helm describes watching Williamson's drummer, James "Peck" Curtis, intently during a live performance in the early 1950s and later imitating this R&B drumming style. Helm established his first band, the Jungle Bush Beaters, while in high school. Helm also witnessed some of the earliest performances by southern country music, blues and rockabilly artists such as Elvis Presley, Conway Twitty, Bo Diddley and fellow Arkansan Ronnie Hawkins. At age 17, Helm began playing in clubs and bars around Helena. While he was still in high school, Helm was invited to join Ronnie Hawkins's band, the Hawks, a popular bar and club act in the South and Canada, where rockabilly acts were very successful. Helm's mother insisted that he graduate from high school before touring with Hawkins, but he was able to play with the Hawks locally on weekends. After his graduation in 1958, Helm joined the Hawks as a full-time member, and they moved to Toronto, Ontario, Canada, where they signed with Roulette Records in 1959 and released several singles, including a few hits. Helm reported in his autobiography that fellow Hawks band members had difficulty pronouncing "Lavon" correctly and started calling him "Levon" (/ˈliːvɒn/ LEE-von) because it was easier to pronounce. In 1961, Helm with bassist Rick Danko backed guitarist Lenny Breau on several tracks recorded at Hallmark Studios in Toronto. These tracks are included on the 2003 release The Hallmark Sessions. By the early 1960s, Helm and Hawkins had recruited an all-Canadian lineup of musicians: guitarist Robbie Robertson, bassist Rick Danko, pianist Richard Manuel, and organist Garth Hudson, all of whom were multi-instrumentalists. In 1963, the band parted ways with Hawkins and started touring as Levon and the Hawks and later as the Canadian Squires, before changing back to the Hawks. They recorded two singles, but remained mostly a popular touring bar band in Texas, Arkansas, Canada, and on the East Coast of the United States, where they found regular summer club gigs on the New Jersey shore. By the mid-1960s, songwriter and musician Bob Dylan was interested in performing electric rock music and asked the Hawks to be his backing band. Disheartened by fans' negative response to Dylan's new sound, Helm returned to Arkansas for what turned out to be a two-year layoff, being replaced by other drummers, including Mickey Jones. With the completion of Dylan's world tour, which included the other four members of the Hawks, Helm went back to Arkansas—to home, to the "woodshed", as he called it, to consider his options. The eventual result was a return to Woodstock to rejoin his group. After the Hawks toured Europe with Dylan, they followed him back to the U.S. and settled near Woodstock, New York, remaining under salary to him. The Hawks recorded a large number of demo and practice tapes in Woodstock, playing almost daily with Dylan, who had completely withdrawn from public life the previous year. These recordings were widely bootlegged and were partially released officially in 1975 as The Basement Tapes. The songs and themes developed during this period played a crucial role in the group's future direction and style. The Hawks members also began writing their own songs. Rick Danko and Richard Manuel also shared writing credits with Dylan on a few songs. Helm returned to the group, then referred to simply as "the band", as it was known around Woodstock. While contemplating a recording contract, Helm had dubbed the band "the Crackers." However, when Robertson and their new manager Albert Grossman worked out the contracts, the group's name was given as "the Band." Under these contracts, the Band was contracted to Grossman, who in turn contracted their services to Capitol Records. This arrangement allowed the Band to release recordings on other labels if the work was done in support of Dylan. Thus the Band was able to play on Dylan's Planet Waves album and to release The Last Waltz, both on other labels. The Band also recorded their own album Music from Big Pink (1968), which catapulted them into stardom. On Music from Big Pink, Manuel was the most prominent vocalist and Helm sang backup and harmony, with the exception of "The Weight." However, as Manuel's health deteriorated and Robbie Robertson's songwriting increasingly looked to the South for influence and direction, subsequent albums relied more and more on Helm's vocals, alone or in harmony with Danko. Helm was primarily a drummer and vocalist and increasingly sang lead, although, like all his bandmates, he was also a multi-instrumentalist. On occasion, Manuel switched to drums while Helm played mandolin, guitar, or bass guitar (while Danko played fiddle) on some songs. Helm played the 12-string guitar backdrop to "Daniel and the Sacred Harp". Helm remained with the Band until their farewell performance on Thanksgiving Day, November 25, 1976, which was the subject of the documentary film The Last Waltz, directed by Martin Scorsese. Helm repudiated his involvement with The Last Waltz shortly after the completion of its final scenes. In his autobiography, Helm criticized the film and Robertson, who produced it. 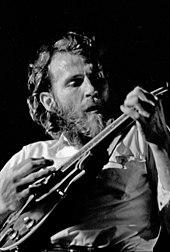 With the breakup of the Band in its original form, Helm began working on a solo album, Levon Helm & the RCO All-Stars, with Paul Butterfield, Fred Carter, Jr., Emmeretta Marks, Howard Johnson, Steve Cropper, Donald "Duck" Dunn, Booker T. Jones and others, followed by Levon Helm. He recorded solo albums in 1980 and 1982 entitled American Son and (once again) Levon Helm, both produced by Fred Carter, Jr.. He also participated in musician Paul Kennerley's 1980 country music concept album, The Legend of Jesse James, singing the role of Jesse James, alongside Johnny Cash, Emmylou Harris, Charlie Daniels, Albert Lee and others. In addition to his work as musician, Helm also acted in several dramatic films. He was cast as Loretta Lynn's father in the 1980 film Coal Miner's Daughter, followed three years later by a role as U.S. Air Force test pilot and engineer Capt. Jack Ridley, in The Right Stuff. Helm was also the latter film's narrator. 1987's under-appreciated End of the Line featured Levon as a small-town railroad employee alongside Wilford Brimley and Kevin Bacon. He played a Kentucky backwoods preacher in Fire Down Below. He played an eccentric old man in the 2005 film The Three Burials of Melquiades Estrada and appeared as Gen. John Bell Hood in the 2009 film In the Electric Mist. He also had a brief cameo as a weapons expert in the film Shooter, with Mark Wahlberg. In 1983, the Band reunited without Robbie Robertson, at first playing with an expanded lineup that included the entire Cate Brothers Band, but in 1985 paring down and adding Jim Weider on guitar. In 1986, while on tour, Manuel committed suicide. Helm, Danko and Hudson continued in the Band, adding pianist Richard Bell and drummer/vocalist Randy Ciarlante and releasing the album Jericho in 1993 and High on the Hog in 1996. The final album from The Band was the 30th anniversary album, Jubilation, released in 1998. In 1989, Helm and Danko toured with drummer Ringo Starr as part of his All-Starr Band. Other musicians in the band included singer and guitarist Joe Walsh, singer and pianist Dr. John, guitarist Nils Lofgren, singer Billy Preston, saxophonist Clarence Clemons and drummer Jim Keltner. Garth Hudson was a guest on accordion on some dates. Helm played drums and harmonica and sang "The Weight" and "Up on Cripple Creek" each night. In the televised 1989 Juno Awards celebration, the Band was inducted into the Juno Awards' Hall of Fame. Helm was not present at the ceremony, but a taped segment of him offering his thanks was broadcast after the acceptance speeches by Rick Danko and Robbie Robertson. Richard Manuel's children accepted the award on behalf of their father. To conclude the televised special, Rick Danko, Garth Hudson, and Robbie Robertson performed "The Weight" with Blue Rodeo. Helm performed with Danko and Hudson as the Band in 1990 at Roger Waters's epic The Wall – Live in Berlin Concert in Germany to an estimated 300,000 to half a million people. In 1993, Helm published an autobiography, entitled This Wheel's on Fire: Levon Helm and the Story of the Band. Helm's performance career in the 2000s revolved mainly around the Midnight Ramble at his home and studio, "The Barn," in Woodstock, New York. These concerts, featuring Helm and various musical guests, allowed him to raise money for his medical bills and to resume performing after a bout with cancer that nearly ended his career. In the late 1990s, Helm was diagnosed with throat cancer after suffering hoarseness. Advised to undergo a laryngectomy, he instead underwent an arduous regimen of radiation treatments at Memorial Sloan–Kettering Cancer Center in New York City. The tumor was then successfully removed, but Helm's vocal cords were damaged, and his clear, powerful tenor voice was replaced by a quiet rasp. Initially Helm only played drums and relied on guest vocalists at the Rambles, but eventually his singing voice grew stronger. On January 10, 2004, he sang again at his Ramble sessions. In 2007, during production of Dirt Farmer, Helm estimated that his singing voice was 80 percent recovered. The Levon Helm Band featured his daughter Amy Helm, Larry Campbell, Teresa Williams, Jim Weider (the Band's last guitarist), Jimmy Vivino, Mike Merritt, Brian Mitchell, Erik Lawrence, Steven Bernstein, Howard Johnson (tuba player in the horn section on the Band's Rock of Ages and The Last Waltz), Jay Collins (Helm's now former son-in-law), Byron Isaacs, and blues harmonica player Little Sammy Davis. Helm hosted Midnight Rambles that were open to the public at his home in Woodstock. "After the finale, they'd have the midnight ramble," Helm told Scorsese. With young children off the premises, the show resumed: "The songs would get a little bit juicier. The jokes would get a little funnier and the prettiest dancer would really get down and shake it a few times. A lot of the rock and roll duck walks and moves came from that." Artists who performed at the Rambles include Helm's former bandmate Garth Hudson, Elvis Costello, Emmylou Harris, Dr. John, Mavis Staples, Chris Robinson, Allen Toussaint, Donald Fagen and Jon Herington of Steely Dan, Jimmy Vivino (of the house band on Late Night with Conan O'Brien), the Max Weinberg 7, My Morning Jacket, Billy Bob Thornton, Alexis P. Suter, Sean Costello, the Muddy Waters Tribute Band, Pinetop Perkins, Hubert Sumlin, Carolyn Wonderland, Kris Kristofferson, Gillian Welch, David Rawlings, Justin Townes Earle, Bow Thayer, Luther "Guitar Junior" Johnson, Rickie Lee Jones, Kate Taylor, Ollabelle, the Holmes Brothers, Catherine Russell, Norah Jones, Elvis Perkins in Dearland, Phil Lesh (along with his sons Grahame and Brian), Hot Tuna (Jorma Kaukonen introduced the group as "the Secret Squirrels"), Michael Angelo D'Arrigo with various members of the Sistine Chapel, Johnny Johnson, Ithalia, David Bromberg, the Youngers, and Grace Potter and the Nocturnals. During this period, Helm switched to the matched grip and adopted a less busy, greatly simplified drumming style, as opposed to the traditional grip he used during his years with the Band. Helm was busy touring every year during the 2000s, generally traveling by tour bus to venues in eastern Canada and the eastern United States. After 2007, he performed in large venues such the Beacon Theater in New York. Dr. John and Warren Haynes (the Allman Brothers Band, Gov't Mule) and Garth Hudson played at the concerts along with several other guests. At a show in Vancouver, British Columbia, Canada, Elvis Costello joined to sing "Tears of Rage." The Alexis P. Suter Band was a frequent opening act. Helm was a favorite of radio personality Don Imus and was frequently featured on Imus in the Morning. In the summer of 2009, it was reported that a reality television series centering on the Midnight Ramble was in development. The fall of 2007 saw the release of Dirt Farmer, Helm's first studio solo album since 1982. Dedicated to his parents and co-produced by his daughter Amy, the album combines traditional tunes Levon recalled from his youth with newer songs (by Steve Earle, Paul Kennerley and others) which flow from similar historical streams. The album was released to almost immediate critical acclaim, and earned him a Grammy Award in the Traditional Folk Album category for 2007. Helm declined to attend the Grammy Awards ceremony, instead holding a "Midnight Gramble" and celebrating the birth of his grandson, Lavon (Lee) Henry Collins. In 2008, Helm performed at Warren Haynes's Mountain Jam Music Festival in Hunter, New York, playing alongside Haynes on the last day of the three-day festival. Helm also joined guitarist Bob Weir and his band RatDog on stage as they closed out the festival. Helm performed to great acclaim at the 2008 Bonnaroo Music Festival in Manchester, Tennessee. Helm drummed on a couple of tracks for Jorma Kaukonen's February 2009 album River of Time, recorded at the Levon Helm studio. Helm released the album Electric Dirt on his own label on June 30, 2009. The album won a best album Grammy for the newly created Americana category in 2010. Helm performed on the CBS television program Late Show with David Letterman on July 9, 2009. He also toured that same year in a supporting role with the band Black Crowes. A documentary on Helm's day-to-day life, entitled Ain't in It for My Health: A Film About Levon Helm was released in March 2010. Directed by Jacob Hatley, it made its debut at the South by Southwest film festival in Austin, Texas and went on to be screened at the Los Angeles Film Festival in June 2010. The film had a limited release in select theaters in the United States in the spring of 2013 and was released on DVD and Blu-ray later that year. On May 11, 2011, Helm released Ramble at the Ryman, a live album recorded during his performance of September 17, 2008, at the Ryman Auditorium, in Nashville, Tennessee. The album features Helm's band playing six songs by the Band and other cover material, including some songs from previous Helm solo releases. The album won the Grammy Award for Best Americana Album. In April 2012, during the Rock and Roll Hall of Fame induction ceremonies in Cleveland, Robbie Robertson sent "love and prayers" to Helm, fueling speculation about Helm's health. Helm had previously cancelled several performances, citing health issues or a slipped disk in his back; his final performances took place in Tarrytown, New York at Tarrytown Music Hall on March 24, and a final Midnight Ramble (with Moonalice as the opening act) in Woodstock on March 31. On April 18, Robertson revealed on his Facebook page that he had a long visit with Helm at Memorial Sloan-Kettering Cancer Center the previous Sunday. On the same day, Garth Hudson posted on his personal website that he was "too sad for words". He then left a link for a video of himself and the Alexis P. Suter Band performing Bob Dylan's song "Knocking on Heaven's Door". Helm died on April 19, 2012 at 1:30 p.m. (EDT) due to complications from throat cancer at age 71. Fans were invited to a public wake at Helm's Barn studio complex on April 26. Approximately 2,000 fans came to pay their respects to the rock icon. The following day, after a private funeral service and a procession through the streets of Woodstock, Helm was interred in the Woodstock Cemetery, within sight of the grave of his longtime bandmate and friend Rick Danko. George Harrison said that while writing his 1970 song "All Things Must Pass", he imagined Levon Helm singing it. Elton John's lyricist, Bernie Taupin, named the song "Levon" after Helm, although the song is not actually about him. Both John and Taupin cited that they were inspired by Helm, Taupin saying in various interviews that they would "go down to their favourite record stores to buy the Band's records" along with Elton. In 1994, Helm was inducted into the Rock and Roll Hall of Fame as a member of the Band. Marc Cohn wrote the song "Listening to Levon" in 2007. "The Man behind the Drums," written by Robert Earl Keen and Bill Whitbeck, appeared on Keen's 2009 album The Rose Hotel. Tracy K. Smith's 2011 poem "Alternate Take", included in her Pulitzer Prize–winning collection Life on Mars, is dedicated to Helm. On the day of Helm's death, April 19, 2012, Tom Petty & the Heartbreakers, in a concert at the First Bank Center in Broomfield, Colorado, paid tribute to Levon by performing their song "The Best of Everything" and dedicating it to him. At a concert on May 2, 2012, at the Prudential Center in Newark, NJ, Bruce Springsteen and the E Street Band performed "The Weight" as a tribute to Helm. Springsteen called Helm "one of the greatest, greatest voices in country, rockabilly and rock 'n' roll ... staggering ... while playing the drums. Both his voice and his drumming were so incredibly personal. He had a feel on the drums that comes out of certain place in the past and you can't replicate it." Springsteen also said it was one of the songs that he had played with drummer Max Weinberg in Weinberg's audition with for the band. On June 2, 2012, at Mountain Jam, Gov't Mule, along with the Levon Helm Band (with Lukas Nelson coming on stage for the closing song) played a tribute set, including "The Night They Drove Old Dixie Down," "Up on Cripple Creek,""It Makes No Difference," and closing with "The Weight." A tribute concert called Love for Levon took place at the Izod Center in East Rutherford, New Jersey, on October 3, 2012. The concert featured many special guests who had collaborated with and were inspired by Helm and the Band, including Roger Waters, Garth Hudson, Joe Walsh, Gregg Allman, Bruce Hornsby, Jorma Kaukonen, John Mayer, Mavis Staples, My Morning Jacket, Marc Cohn, John Hiatt, Allen Toussaint, Jakob Dylan, Mike Gordon and others. Proceeds from the concert were to "help support the lasting legacy of Levon Helm by helping his estate keep ownership of his home, barn and studio, and to continue the Midnight Ramble Sessions." At the 2013 Grammy Awards, the Zac Brown Band, Mumford & Sons, Elton John, Mavis Staples, T-Bone Burnett and Alabama Shakes singer Brittany Howard performed "The Weight" as a tribute to Levon and other recently deceased musicians. They also dedicated the song to the victims of the Sandy Hook Elementary School shooting. In May 2013, the New York State Legislature approved a resolution to name State Route 375—the road which connects State Route 28 with the town of Woodstock—"Levon Helm Memorial Boulevard". Governor Andrew Cuomo signed the bill on June 20, 2013. In July 2017, U.S. 49 from Marvell, Arkansas to Helena-West Helena was named The Levon Helm Memorial Highway by Act 810 of the Arkansas State Legislature. The Levon Helm Legacy Project is raising money to commission a bronze bust of Helm and to restore his boyhood home. The house, originally located in Turkey Scratch, Arkansas, was moved in 2015 to Marvell, where Helm attended school. Helm met singer-songwriter Libby Titus in April 1969, while the Band was recording its second album. They began a lengthy relationship, which produced daughter Amy Helm (born December 3, 1970). Amy formed the band Ollabelle and performed with her father's band at the Midnight Rambles and other concerts. Helm met his future wife, Sandra Dodd, in 1975 in California, while he was still involved with Titus. Helm and Dodd were married on September 7, 1981. They had no children together. ^ a b "Levon Helm Dies at 71". Poughkeepsie Journal.com. Retrieved April 19, 2012. ^ "100 Greatest Singers: Levon Helm". Rolling Stone. May 26, 1940. Archived from the original on January 4, 2011. Retrieved December 5, 2012. ^ "Woodstock residents Levon Helm, Steve Earle win Grammys". dailyfreeman.com. Retrieved October 18, 2011. ^ a b "Best Americana Album". Grammy.com. Retrieved December 9, 2011. ^ "Levon Helm Biography". Archived from the original on May 9, 2012. Retrieved April 20, 2012. ^ a b c Bowden, Bill. "Helming A Memorial: Musician's fans hope for statue, restored boyhood home in Marvell." The Free Weekly, August 3, 2017. 2. ^ This Wheel's on Fire: Levon Helm and the Story of the Band, Levon Helm with Stephen Davis, Plexus, London (1993), p. 48. ^ "Lenny Breau: The Hallmark Sessions". Theband.hiof.no. Retrieved September 13, 2018. ^ "Who Plays What Instruments "Index"". Geocities.jp. Retrieved October 18, 2011. ^ "Levon Helm's midnight ramble with Grace Potter and the Nocturnals // Grace Potter and the Nocturnals". This Is Somewhere. January 11, 2010. Archived from the original on December 3, 2013. Retrieved December 1, 2013. ^ "The Band's Levon Helm, Making Music Again". NPR. July 29, 2006. Retrieved December 1, 2013. ^ "Browse businesses and events in Los Angeles – FindLocal Los Angeles Times". calendarlive.com. Retrieved October 18, 2011. ^ "2008 Bonnaroo Lineup". Bonnaroo.com. Archived from the original on October 16, 2011. Retrieved October 18, 2011. ^ "Wanee Music Festival – April 11th & 12th Live Oak, Florida". Waneefestival.com. Retrieved October 18, 2011. ^ "Levon Helm Going "Electric" This June". Billboard. Retrieved December 1, 2013. ^ "Living legend Levon Helm finally gets his close-up in 'Health' - latimes.com". Latimesblogs.latimes.com. June 25, 2010. Retrieved December 1, 2013. ^ Mark Deming. "Ramble at the Ryman review". AllMusic. Retrieved December 12, 2011. ^ "Robbie Robertson Sends "Love and Prayers" to Levon Helm at Rock Hall Ceremony". Retrieved April 17, 2012. ^ "Levon Helm, singer and drummer for The Band, in final stages of cancer". LevonHelm.com. Archived from the original on April 22, 2012. Retrieved April 18, 2012. ^ Collis, Clark (April 19, 2012). "Robbie Robertson pays tribute to ailing Levon Helm: 'I will miss him and love forever'". Entertainment Weekly. Retrieved April 19, 2012. ^ "Robbie Robertson on Ailing Levon Helm: 'I'll Miss Him and Love Him Forever'". ABCNews.com. April 19, 2012. Retrieved April 20, 2012. ^ "Levon Helm dead at age 71". Retrieved April 19, 2012. ^ Jon Pareles (April 20, 2012). 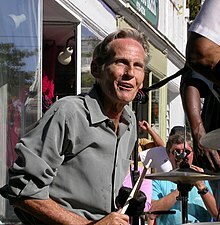 "Levon Helm, Drummer and Rough-Throated Singer for the Band, Dies at 71". The New York Times. Retrieved April 20, 2012. ^ "George Harrison: 'All Things' In Good Time". Billboard.com. Retrieved July 16, 2013. ^ "In the Elton John song "Levon," who is Alvin Tostig?". The Straight Dope. March 24, 2000. Retrieved December 1, 2013. ^ "Bernie Taupin :: Blog". Berniejtaupin.com. Archived from the original on December 3, 2013. Retrieved December 1, 2013. ^ Kurt Schlosser (May 3, 2012). "Bruce Springsteen pays tribute to Levon Helm with cover of 'The Weight' - NBC News.com". Entertainment.msnbc.msn.com. Archived from the original on May 6, 2012. Retrieved December 1, 2013. ^ "Need We Say More? 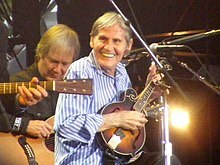 > News > Levon Helm Tributes Highlight Mountain Jam 2012". Jambands.com. June 4, 2012. Retrieved December 5, 2012. ^ "Welcome". Love For Levon. October 3, 2012. Retrieved December 5, 2012. ^ "Levon Helm To Be Celebrated With "Love For Levon"On October 3, 2012 at the Izod Center". Love For Levon. Retrieved January 23, 2014. ^ "Elton John, Mumford Sons Lead Tribute to Levon Helm at Grammys | Music News". Rolling Stone. February 11, 2013. Retrieved December 1, 2013. Wikimedia Commons has media related to Levon Helm.